Between this world and the next, a life will change, and a love will begin. Make a really slow 3 hour movie into a semi-slow 2 hour movie. 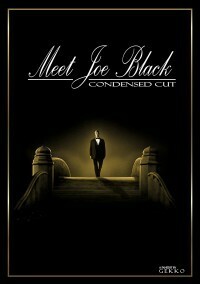 This is just a faster cut of Meet Joe Black. A lot of the redundancy and minor plot points were removed. Some of the slow dialogue scenes were also re-edited to flow a little quicker. It still feels a little long at 2 hours, but I guess it’s better than 3 hours. - Removed Allison Parrish party planning scenes. - Removed Joe and Susan sleeping together. - Removed Joe visiting Susan at the hospital. - Trimmed several dialogues for faster pacing.